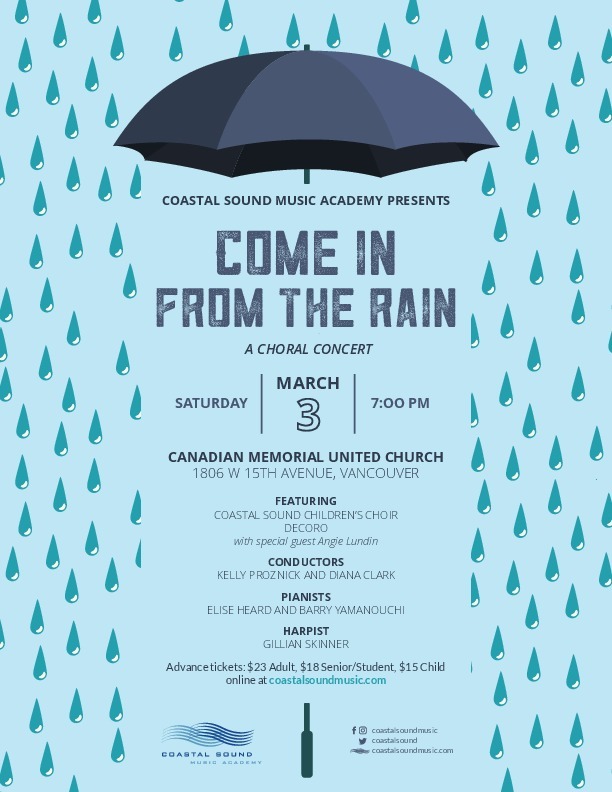 Coastal Sound Music Academy presents "Come in From the Rain", a Spring concert featuring our award-winning Children's Choir and adults-only choir DeCoro. We all need a little inspiration at this time of year, and we find it in Gustav Holst’s Rig Veda, based on the ancient Sanskrit poems that honour thousands of manifestations of God. We’ll be performing four of these hymns that include rippling harp arpeggios to illustrate “Hymn to the Dawn” and the gentle “Hymn to Vena-Sun rising through the mist”. 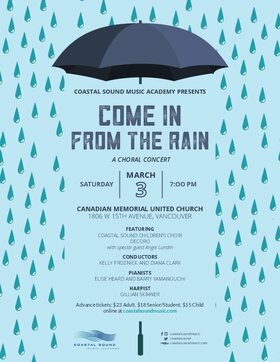 DeCoro and Coastal Sound Children’s Choir along with guest harpist Gillian Skinner, will offer shelter from the rain with warm and uplifting music. Our own Angie Lundin will be featured vocal soloist singing Melissa Manchester’s 1982 hit song, Come in From the Rain.